The Spencer is the perfect getaway for the whole family. This 3 bedroom WV log home cabin is 1260 square feet on 2 levels and sleeps eight in three queen bedrooms and on a queen sleeper sofa. There are 2 bedrooms and 1 bath upstairs and 1 bedroom and 1 bath downstairs. The cabin living room area features a wood-burning stone fireplace with wood, TV with basic Dish Network package, VCR/DVD, telephone and a spacious covered front porch deck with hot tub and gas grill. The cabin is furnished with central heating and cooling. 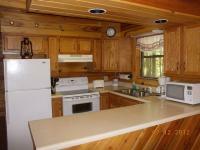 The fully equipped kitchen has all major appliances, cookware and utensils. All bed linens and towels are provided to help make your stay more convenient and enjoyable. We also include lots of additional amenities for your convenience such as coffee, tea, sugar, creamer, paper towels, foil and other items too numerous to mention. All you need to do is be prepared to relax and enjoy your cabin stay. Choose from many year round outdoor attractions including the New River Gorge, New & Gauley River whitewater rafting with our sister company Adventures Mountain River, nearby Winterplace Ski Resort for great snow skiing and tubing, boating at Summersville Lake, New River Gorge Bridge Visitors Center, hiking, golf, horseback riding, ATV, fishing and two nearby state Parks. A written notice of cancellation must be received within 30 days prior to your cabin arrival date for a refund or rain check to be given. A non-refundable $25 handling fee will be deducted from each refund or rain check. There are no refunds or rain checks within 30 days of your cabin arrival date. We require a deposit of 25 percent of the rental rate to confirm reservations. Your balance will be due 30 days prior to arrival. Reservations made within 30 days of check-in require full payment. A $100 security deposit will be added to your reservation amount. Upon successful inspection of the cabin, the deposit will be refunded within 30 days. Rates are subject to change, taxes not included. All rates quoted are per night and based upon a two-night minimum stay. It is our policy to rent to family-type groups. No house parties are allowed. No pets allowed. We accept all major credit cards and personal checks. Check-in is 4pm Check-out is 11 a.m. If you plan to check in after 5 p.m., please let us know so we can make arrangements. The check in is at the Country Road Cabins office on Sunday Road. If an after-hours check in is required, your keys will be left for you at the cabin. Gauley Season: $385.00 Weekend per night.